The antique valve indicator was probably placed over a steam valve that was opened or shut off steam to an impeller that made the vessel go astern. Both the wheel and the sign are solid brass. These were polished, buffed and sealed with a clear brass lacquer. 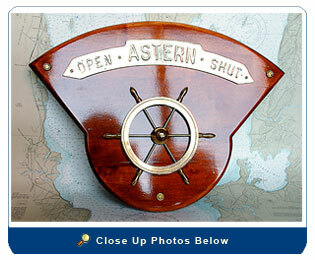 The mounting board is solid maple and was custom made to accommodate this nautical memorabilia and was sealed with three coats of marine spar varnish. Size: The brass wheel is 5 ½” in diameter and 8” spoke to spoke. 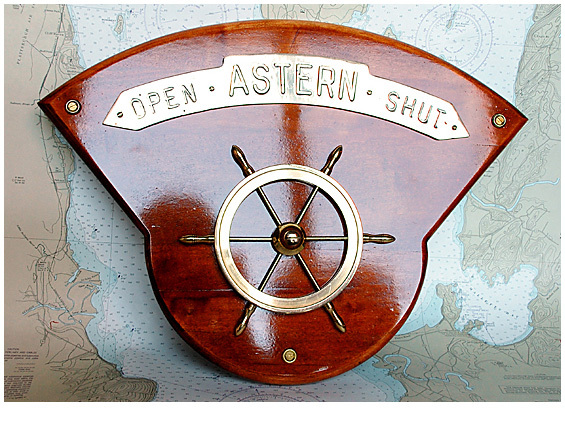 The wood plaque is 19” by 14”; the brass “open & astern” plaque is 14” long and 2 ½” high.